Summers are up!! Deciding the outfit in the hot sizzling summers becomes a hectic task. We usually think of a dress that is comfortable and looks good on us. Looking for the hottest styles of dresses, for less? Here we are providing you 5 dresses that you can go for. Black Midi with Lace up scooped knit will go well in any party or meet up. Gives a great look. It is short sleeve midi dress featuring a mock neck accent and lace-up with contrast grommet fixtures.The dress is in ribbed pattern throughout with scooped hem. Also, It is double stitched, unlined, Knit and light weighted. It is made up of 95% Rayon and 55% Spandex. Can be easily washed by hand. Short sleeve mini dress featuring a high neck and a floral applique inset. 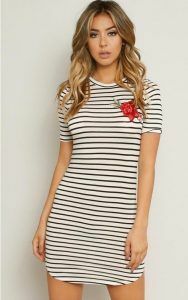 It is in striped print throughout with fit scooped hem.The dress is double stitched and Knit thoroughly. It is Light weighted and made up of 95% Rayon and 55% Spandex. Shortalls featuring light fade with wrinkle and distressed accents. Equipped with one open front pocket, two open front side pockets, and two open back pockets. Has adjustable double buckle straps.The dress too has two button placket sides and roll cuffs. Also, it is unlined, Knit thoroughly. Made up of 70% Cotton, 29% Polyester,1% Spandex. Needs Machine wash.
100%Rayon. Can be wash by hands easily. Floral print overall features a metal buckle straps and a v-neckline.Has high waistline.Equipped with five side button snaps. Has wide leg pant. Racerback ruched detail.Also, It is Lined, Woven and light weighted. Made up of 100%Rayon. Needs hand wash.
Shop for your next Maxi dress, Long dress, Short dress, Party dress, Club dress, Woven dress & more at ♥ SFL . PREVIOUS POST Previous post: Okwu launched Omicron smartphone for 10,499 INR.